In the summer of 1924 we moved from the J.A. Ranch to Clarendon. I started school there in Sept in 2nd grade. After Christmas I had the chicken pox. While we lived there my cousin Buren Ware and his bride of a few months visited us. My Dad bought a Model T. truck and hauled feed & cotton from the farms into towns. harvested. The binder would bog down in the mud. Mom’s brother Wallace stayed with us that fall and winter to help harvest. At Christmas time Dad went into town and came home with groceries and some material for Mom to make quilts and a little chair each for Oscar and Eva. The rest of us didn’t get gifts. In the summer Grandma Melton stayed with us and taught me how to make cloths for my doll. I learned to make collars, cuffs, button holes, put in sleeves, hems & trims. In Jan or Feb Dad moved us to Hall county so we could go to school. When it came time for the next crop (spring of 1927) we got no rain. The soil was black and heavy and couldn’t be plowed so by July Mom & Dad sold every thing including household goods to a Mr. Joe Bice a neighbor. He bought another Ford truck and we started to Colorado where he hoped to get work. We went to Pampa an oil field town where Uncle Sid and family lived. He was out of work so he and his family went with us. We went as far north as Yampa, Colo, where Dad and Uncle Sid worked in the hay. In Sept we were in Denver. Uncle Side wired a relative for money and bought a Page car and left for Abernathy Texas and we went to Aunt Lizzies & Wheeler. Dad got a job picking cotton and a farm house to live in. On Oct 25th my brother Frank was born. Grandpa Moore was visiting with us and Dad took him into Wheeler and got Aunt Lizzie and called the Dr. All this about 10.00 P.M. I spent my time taking care of Mom & baby and cooking and the rest picked cotton. I had my 12th Birthday while at this place. Ruth & I went shoe shopping. I bought a pair of grey trimmed in alligator. Ruth got a pair brown old lady, sharp toe brown leather. I think they cost $1.00 and mine $4.00. In Jan of 1928 we went to Hall County to Uncle Othal’s. As we went through Wheeler we stopped for a short visit with Bernice and Ivy. (margin note: Refer to that page.) They had a new home almost completed. We stayed at Othals for several days or perhaps a few weeks. I believe Aunt Naomie was expecting another baby who arrrived as Dorothy Joe. While here Ruth &Dad went to Esltelene to visit Buren and spent the night. It was here that our pretty dolls got eaten by the horses. They were packed in the trunk and the horses were tall enough to reach into the truck. The dolls bodies were made of straw. Before we went to Amhurst we visited Moms Bros. in Lubbock. ….began school at Amhurst and Dad went to work at a grain Elevator. (x mark in margin) While we were in Wheeler we visited Aunt Mattie. They left for Calif. leaving Adrain and Bernice behind. When cotton was ready to chop we worked in the fields. Then Dad and one or two others went to Hobbs New Mexico to find work. The rumor was that there was a new oil field and the town was booming. They arrived there on July 4th. The area wasn’t advanced enough for jobs so they headed home. On the way Dad got us a job chopping cotton and a house to live in between Whitbarrel & Levelland. So we loaded up & moved again. When school began we rode the bus into Levelland and I entered the 5th grade. We moved from what we called the Garrett place to the Kimpson place which we spent the winter there. In the spring (1929) we moved about a mile to another place. Only 2 rooms but a much nicer house and had a barn and windmill. We chopped cotton that summer and in the fall started to the same school I was in 6th grade. We quit school when cotton was ready to pick and worked for a Mr. Hofacket. We were there when the crash of 29 came. At Xmas time I went to a party with Mr. Hofacket’s son Vernon. (My first date.) I was only 14 and Mother made me take my sister Ruth along. Vernon gave me a Kodak camera & film shortly after Xmas. In early Jan of 1930 we moved 7 or 8 miles west to work for people by the name Cunningham. We lived in a double garage with dirt floor. About the same time Mr. Hofacket rented 2 farms, one about 1/4 miles from Cunningham’s. The other about 1 1/2 miles. Mr. Hofacket let us move into this place. It was 2 rooms, small barn, windmill and garden spot. That summer we made a trip to Roswell made syrup & picked cotton in fall. In 31 we went south of Levelland & picked cotton & on to Bula to work and to Othal’s where I stayed with Grandma & went to school. That fall we picked cotton & bought flour shortening backing powder and shortening, in early 1932 we went to Abernathy & lived by Hefners. Chopped cotton and early fall moved to Sudan & built a tent. Picked cotton & stayed there during 1933 started to school at Sudan in 8th grade picked cotton killed a big hog, worked for Mrs. Trapp (Frapp?). 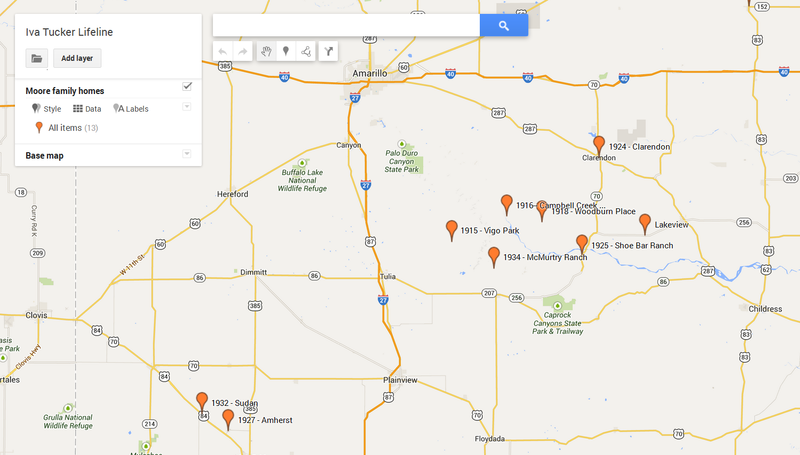 In April of 1934 we moved to McMurty Ranch. I met Cecil in Sept and we married in Jan of 1935.